Your tile design doesn’t have to be the typical bland patterns that deck out most bathrooms and walls. You are allowed to get a little creative and think outside the box. Here are six example where people went above and beyond with their design brief and will put your tiles to shame. This is one way to add some colour to a seemingly boring shower. 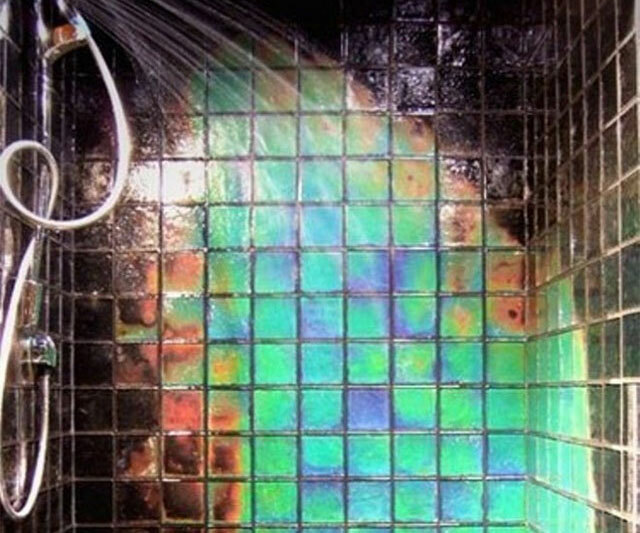 Heat sensitive glass tiles will blossom with colour when you touch them with a warm hand or when they get a blast of hot shower water for a lovely evocative experience. Easy now, you may not want to get out of the shower as you relax in front of the changing patterns. Kids need showers too as sometimes it can be their least favourite activity. Sometimes you need all the help you can get to entice them into getting clean. This cool splash tile design could be half the battle done, creating a cool design that makes shower time more fun. These grey-toned office wall tiles may be in dreary office colours but the change the game up a little with their geometric shapes and interesting texture. They go some way towards muting the room acoustics too, nothing worse than a loud desk neighbour. There is a lot going on in this bathroom, colour, design and intricate carvings but we like it. Can’t choose between designs and colours? Why not use them all! 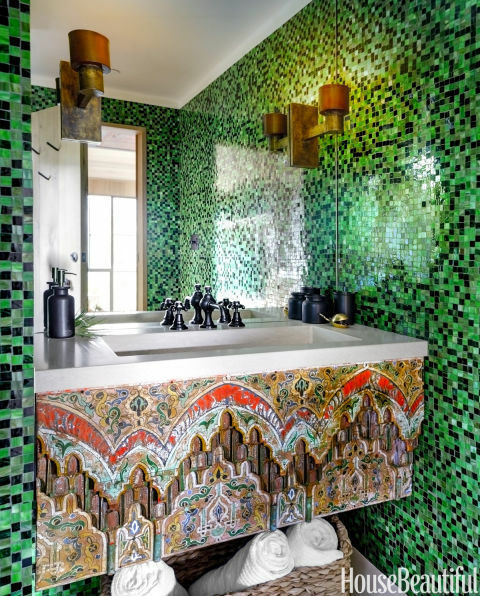 Like this mix of colourful tile and Turkish panel design, sometimes clashing on purpose can be just the trick. This beautiful and elegant pool tile design is in the courtyard of Italian Vogue editor Franca Sozzani in her home in Marrakech. 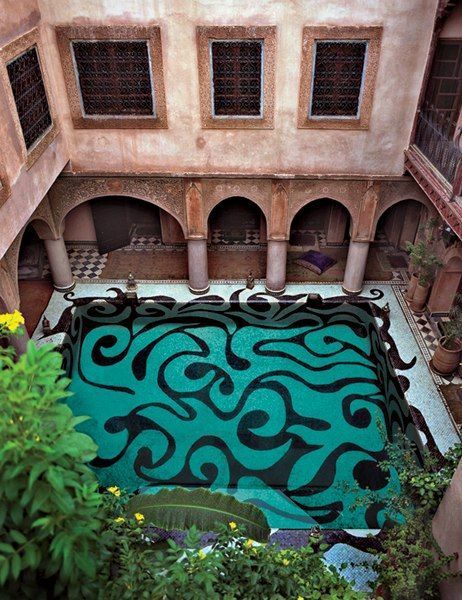 The intricate and exotic pattern seems to be spilling out of the pool and seems the perfect, relaxing design for a Moroccan abode. This rainbow colour wheel design would be a beautiful addition to any shower. The colour swirl follows the flow of water to the drain making the shower experience that little bit more magical. Fair play to the tiler who painstakingly put this together.